There is silence among State-level leaders about any reforms in their domain. They want only a larger share of Central resources. This will decelerate growth rates and increase inflation as many State governments have stopped short of real governance. It can be clearly seen from the above that the focus of reforms is mainly on Corporate India and its interface with the Centre. Drivers of growth are not just the Government (which has a share of 20 per cent in GDP); it is not only the corporate sector too (whose share in GDP is around 15 per cent), but family-run enterprises (which have 40 per cent share in GDP). They are the dominant players in construction, road transportation, wholesale and retail trade, hotels and restaurants, and all types of services such as plumbing, carpentry, electrical, etc. They have been growing at more than 8 per cent in real terms in the last decade and are the real engines of growth; the focus of reforms should have been on this sector. More than 60 per cent of their credit need is met by the “unorganised” markets. Their performance and role in India’s growth story is not due to the Government but despite it. The regulations pertaining to the activities in which the non-corporate (India Uninc) sector dominates are in the realm of State governments. Some of them are: commercial tax; road tax; entertainment tax; excise duty on liquor; urban land ceiling and regulations (ULCRA); Shops and Establishments Act; laws governing educational, medical, etc., institutions; money-lending regulations; Stamp Duties Act; Food and Adulteration Act — municipalities; water/power/drainage regulation Acts; and the Registrations/Contracts Act. These Acts and regulations create massive amounts of black money and are fountainheads of corruption at the lower levels. They destabilise small businesses and increase the cost of operations. There is a clamour for more pay for Government employees. One of the arguments is that they are paid less than their private sector counterparts. This is not true for the lower category of Government employees as their emoluments are much higher than those in the private sector. In the private sector — particularly in small businesses — even today, there are thousands of employees slogging it out for less than Rs 10,000 (total emoluments) a month. The government babus, even at the lowest level, get medical benefits and leave travel benefits, which add up to a good pay packet. In the case of higher-level babus, the huge mansions they get to live in and the retinue of servants, such as maalis and cooks, are not monetised in the benefit packet. Another argument is that the pay hike would reduce corruption. This is far from the truth as corruption has only increased phenomenally after the earlier Fifth Pay Commission. The state has become an extortionist organ. Sophisticated words such as ‘rent-seeking’, propounded by some economists, are euphemism for extortion. In India, the index of middle-class misery can be measured by adding tax, inflation and corruption rates. A significant level of reforms has to be initiated at the State-level; reforms are particularly important for different segments of the service sector, such as trade; transport; hotels and restaurants; construction; and other personal services. It must be remembered that the service sector’s share in our national income is around 60 per cent. Non-corporate forms of organisations dominate many of these activities. The level of corruption is phenomenal at the State-level and the raids conducted by the Lokayukta in Karnataka and the information on the amount of wealth accumulated by government employees is mind-boggling. The amounts involved run into crores and it is unfortunate that these cases do not proceed beyond a point since the necessary permission to follow up is not easily given by the higher authorities. We find that a phenomenal amount of money is extorted by the various organs of the State and, to that extent, it will be very difficult to expect them to initiate action on the reforms front. The State-level politicians have become capricious and it is becoming increasingly difficult for business to be carried out in the normal process, leave alone starting any new business. It is becoming clear that the level of extortion is increasing at an alarming rate. Witness the clamour to become MLAs, even paying several thousands of rupees to a party as caution deposit (non-refundable) to be selected as a candidate. Many of these worthies often cannot even speak more than a few coherent sentences in their mother tongue in the Assembly. The real enthusiasm is for undertaking legitimatised dacoity at the State level rather than any public service. It is no secret that in many departments — police, sales tax, liquor, excise, land registration, and road transport — ‘critical’ location postings are on a “on payment” basis. Needless to add, these bribe tax collections are done with the connivance and/or encouragement of the top political leaders, who usually get a large share of this. Even in the educational field, the situation is alarming. In many States, there is a price (talked about in crores) for getting appointed as vice-chancellors. Any reformer should internalise the age-old dictum that “government is not a solution but a problem”. Sadly, civil society, particularly the middle-class, is disconnected from the state. Ordinary citizens dread entering an RTO or a police station, a water and sewerage board office or an electricity department as extortionists called government servants wait there for their prey. Hence, our forecast is that the reforms will flounder at the cutting edge areas of interaction with ordinary citizens. 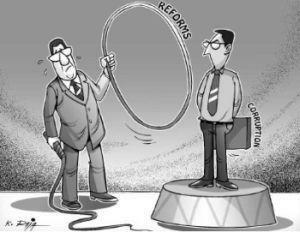 There is silence among State-level leaders about any reforms in their domain. They want only larger share of Central resources. This will decelerate growth rates and increase inflation since many State governments have stopped short of real governance.